John Albert “Horse” Yosten was born March 7, 1844 in Koblenz Germany. He came to the United States at age 4 with his family and settled in Eire Pennsylvania. At age 21 he was paid $500 to take the place of a man who had been drafted, a common practice in those days. He began service in the U.S. Navy and from 1864 to 1865 served as a “landsman”/spotter in the crow’s nest of the merchant steamship, the USS Wamsutta, converted to a gunboat. The Wamsutta patrolled Newport River in Georgia and the coast of South Carolina. His naval sword is still in his family. After the war, he returned to Pennsylvania and married his sweetheart Katherine Vogel. He took his bride west and homesteaded in Nebraska and they raised a family of 8 sons and 2 daughters. When he retired, his Civil War lump pension was enough to buy each of his 10 children a sack of dry beans. 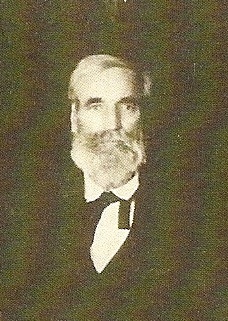 Later in life, he moved by covered wagon to a German settlement, Muenster, Texas, for his health. When died August 13, 1927, he had 78 grandchildren, 12 of whom would serve in WWII, one KIA on the USS Jarvis in the battle of the Savo Islands. John has over 2500 descendants.